This tool is licensed under the NEO4J PRE-RELEASE LICENSE AGREEMENT. Download & unzip the latest neo4j-etl.zip. For detailed usage see also the: tool documentation. Then the next time you start Neo4j Desktop you’ll see Neo4j ETL as a UI to be used interactively. The drivers for MySQL and PostgreSQL are bundled with the Neo4j-ETL tool. To use other JDBC drivers use these download links and JDBC URLs. Provide the JDBC driver jar-file to the command line tool or Neo4j-ETL application. And use the JDBC-URL with the --rdbms:url parameter or in the JDBC-URL input field. The Neo4j ETL, especially the neo4j-etl command-line tool, can be used to import well modeled (i.e. normalized) relational data into Neo4j. It applies some simple rules for transforming the relational model. This is the command-line tool you use to retrieve and map the metadata from your relational database and drive the export from the relational and import into Neo4j database. With the graphical user interface you can preview the resulting graph data model and eventually adapt it by changing labels, property names, relationship-types and property types. It supports all relational databases with a JDBC driver, like MySQL, PostgreSQL, Oracle and Microsoft SQL. You can get the latest version of the import tool from GitHub. Once downloaded and uncompressed the operating system specific zip / tar.gz, you also need download the proper JDBC Driver and add it to the lib folder. For very large databases make sure to have enough disk-space for the CSV export and the Neo4j datastore and enough RAM and CPUs to finish the import quickly. Delimiter to separate fields in CSV. none: All tables are included in the process. other columns types will be included. none: All columns types are included in the process. none: All columns are included in the process. Path to file containing Neo4j import tool options. 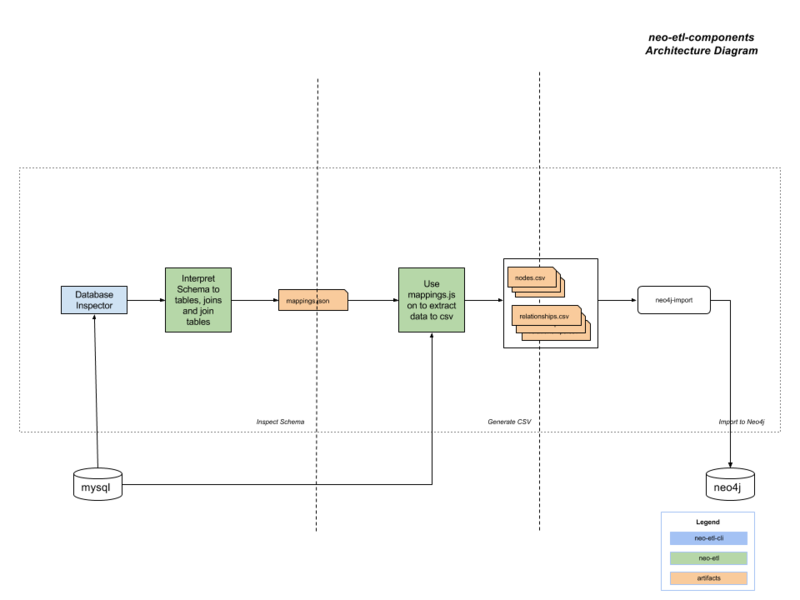 Path to the output metadata mapping file. Port number to use for connection to RDBMS. Character to treat as quotation character for values in CSV data. Password for login to RDBMS. Url to use for connection to RDBMS. User for login to RDBMS. Lists all schemas to include by name or pattern. Lists all tables to include/exclude by name or pattern. Path to directory for intermediate CSV files. Path to destination store directory. Force delete destination store directory if it already exists. Path to directory containing Neo4j import tool. cause the CSV resources definitions to be read from standard input. Password for login to Neo4j. Url to use for connection to Neo4j. User for login to Neo4j. Import tool that will be used to load data into neo4j. Above there is an Example of config file. This example session is based on the Northwind example dataset. Resolve relationships through composite keys. Support most of the data types. Blobs are skipped while importing until the import-tool supports binary array data. A Foreign Key is usually used to create a relationship between 2 nodes without being saved as a property. With this flag, the node would keep that value as a property. Ex: A loan has the SSN of the loan applicant which would normally be used to connect the Loan and Person nodes. With this flag the Loan node will also keep the SSN as a property. A Neo4j-ETL graph application can be added Neo4j Desktop which allows visual editing of the mapping and interactive import. 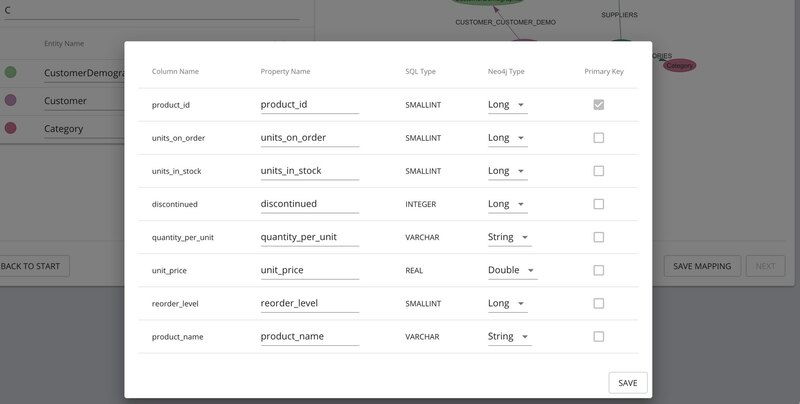 The UI allows you to change and set you preferred label names, property names and types, relationship types, with a preview of the resulting graph.